“Physicists from the University of Basel have developed a memory that can store photons. These quantum particles travel at the speed of light and are thus suitable for high-speed data transfer. The researchers were able to store them in an atomic vapor and read them out again later without altering their quantum mechanical properties too much. 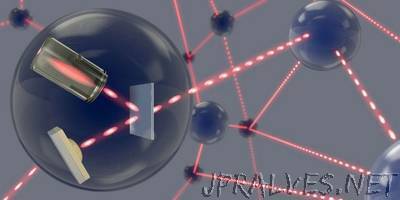 This memory technology is simple and fast and it could find application in a future quantum Internet. The journal Physical Review Letters has published the results. Even today, fast data transfer in telecommunication networks employs short light pulses. Ultra broadband technology uses optical fiber links through which information can be transferred at the speed of light. At the receiver’s end, the transmitted information has to be stored quickly and without errors so that it can be processed further electronically on computers. To avoid transmission errors, each bit of information is encoded in relatively strong light pulses that each contain at least several hundreds of photons.